This is the first of four daily recaps by Matthew Delmont, author of Making Roots: A Nation Captivated (coming August 2016) about the remake of Alex Haley’s Roots television miniseries airing on HISTORY Channel. If you have not seen the first episode yet, you may be spoiled. After nearly forty years, Roots is back and the first episode of the History Channel’s reimagined Roots was very promising. The differences between the original series and this new series were apparent almost immediately. The episode opens with a voice-over from Laurence Fishburne, who plays Alex Haley, the author of Roots. This introduction is very brief (“This is how I heard about the boy, Kinte, and this is how I will tell you his story”), but it sets the tone that viewers should see Roots first and foremost as a story that will combine elements of fact and fiction. At the same time, the producers have made it clear in promoting the new series that this version aims to be more historically accurate than the 1977 version. This comes through clearly in the first half-hour of the episode, where were see Kunta’s birth and manhood training in Gambia. 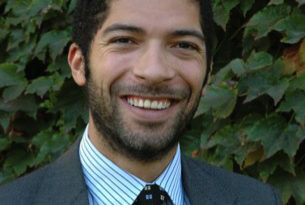 Kunta’s village, Juffure, is a busy trading hub and Kunta considers going to a university in Timbuktu. This episode portrays eighteenth century West Africa as a much more advanced society than how it was presented in the original book or television series. Alex Haley knew about this more complex history, but he chose to portray Gambia as an African Eden. “I, we, need a place called Eden,” Haley said. “My people need a Plymouth Rock.” Another way the new series troubles this vision of an African Eden is by detailing the ways Africans would capture members of different ethnic groups and use or sell them as slaves. This is the fate that befalls Kunta when he is captured, sold to English slave traders, and branded with the initials of the slave ship, the Lord Ligonier, which will carry him and 139 other Africans to America. What is particularly interesting in this opening segment is that the series does not rush to get familiar actors on screen. In the 1977 version, producer David Wolper thought that the show needed to get established stars on screen early to keep the audience’s attention. Cicely Tyson and Maya Angelou were in the first scene and the writers created the character of the slave ship captain so Ed Asner would be on screen in the first ten minutes. In the new Roots, by contrast, there are no established film or television stars in the opening segment and no white characters in the first half-hour. This is a bold way to open the series, but it allows viewers to be reintroduced to Kunta Kinte (played by Malachi Kirby), Omoro Kinte (played by Babatunde Olusanmokun), and others, while appreciating how these excellent actors are creating new versions of the characters. One of the challenges with any remake is how to create narrative tension when audiences already know the basic story. This was especially true with the Middle Passage scene. 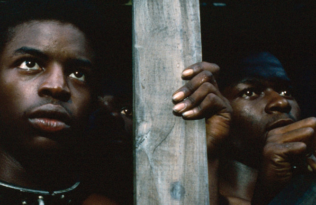 Viewers know that Kunta Kinte has to survive the voyage for the story to continue. Viewers also know Kunta will be a slave in America, so when the enslaved Africans plan to take over the ship, viewers know that the revolt cannot be successful. Still the scene works because of the details. Kunta holds hands with the man next to him on the ship while they discuss the plan to fight back. This is a tender and touching moment amidst the swirl of violence and inhumanity on the ship. And the scenes where the enslaved women and men pass codes to each other through songs, nicely show the cunning and resistance that led to many revolts among enslaved people. I knew they were not going to be able to overtake the ship, but as the chanting intensifies (“Oh my brothers, dance!”) I still got chills. Parts of this episode felt rushed, which is to be expected of a story that covers over a hundred years. The scene I found especially worrisome was when an unnamed enslaved woman offers herself to Kunta. We have not been introduced to her and do not learn anything else about her other than that she is willing to have sexual relations with Kunta. The scene is an occasion for Kunta to say that he does not want his children to be born into slavery, but there must be a way to convey this without having an unnamed character throw herself at him. The most iconic scene in the original series is the whipping scene, where Kunta Kinte is whipped until he answers to his slave name, Toby. One interesting thing about this scene is that it is not in Haley’s book; it was imagined and written by television screenwriter Bill Blinn. The whipping is the climax of the first episode of the new Roots and, four decades later, it remains a powerful and disturbing scene. Connolly, the Waller plantation overseer (played by Tony Curran), is evil and sadistic. As he beats Kunta he demands, “Say your name so you know this isn’t Africa, this is Virginia; that you are the property of Waller no different than the hogs and horses.” Television is more violent today than it was in 1977 and I was not sure how this scene would work in the era of Game of Thrones. The scene works because the violence is connected to the narrative (“Your name is your shield” is one of the taglines for the series) and because, while this scene is fictionalized, it references countless historical acts of violence against enslaved people. In short, the stakes are higher here than in an ordinary television drama. Let me end with my favorite moment from this first episode. Kunta is singing a song that he has learned from his mother in Gambia. Fiddler (played by Forest Whitaker) says he remembers his grandmother playing a similar melody and says, “I’ve been chasing that tune for a long time.” Fiddler asks what the tune is to which Kunta replies, “the song is mine, no one in this place can have it.” Fiddler assures Kunta, “I can wait ‘til you share it with me.” The scene is only a couple of minutes long, but it is beautifully acted and speaks to the themes of culture, memory, and loss that are at play in Roots. The quiet moments are what I appreciated most about the original Roots. I am happy to see that the new Roots is creating three-dimensional black characters to reimagine this remarkable story. 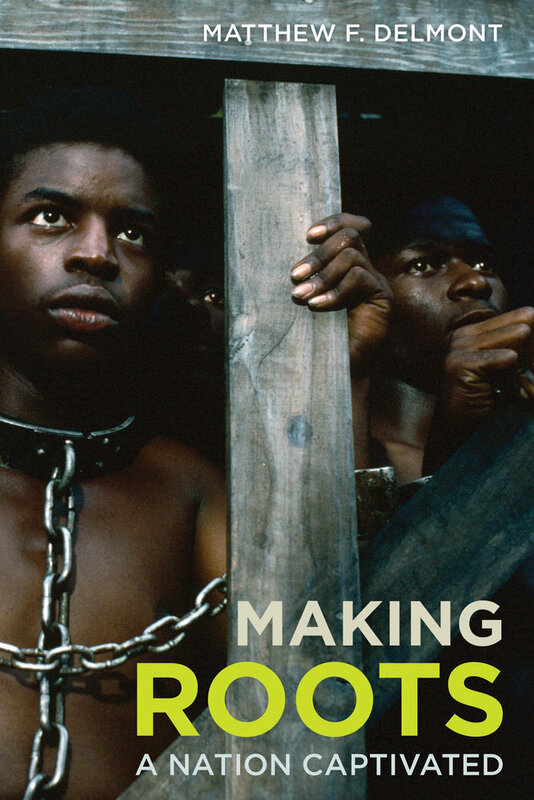 Coming 8/2/16: Making Roots: A Nation Captivated; to pre-order a copy, visit your local bookstore, or order online at Indiebound, Amazon, Barnes & Noble, or UC Press (save 30% at ucpress.edu; enter discount code 16M4197 at checkout). 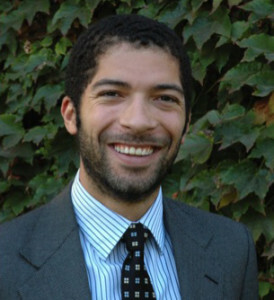 Matthew F. Delmont is Associate Professor of History at Arizona State University and the author of Why Busing Failed: Race, Media, and the National Resistance to School Desegregation and The Nicest Kids in Town: American Bandstand, Rock ’n’ Roll, and the Struggle for Civil Rights in 1950s Philadelphia.